ima-pim is NOT an Online-Plattform! ima-pim is the software tool for the professional management of your personal and business relationships network. Thank you for showing interest in my PIM software ima-pim. It's been my aim to write a software that is capable of providing good assistance for maintaining friendly relations with a large number of people. As personal relationships tend to become more and more important, a more specialized tool had to be developed that meets the demands of networkers. And here it is! ima-pim knows when you interacted with what person - that's why it is able to move those people into your field of vision that should be contacted again. Keep up with all your contacts. -> That's how it works. 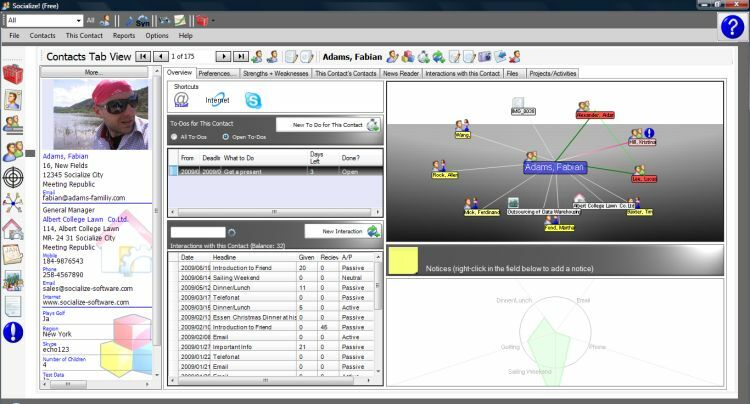 ima-pim presents your contacts, activities, tasks, files and other objects in graphical and interactive network graphics. Grasp links and relations between people and objects at a glance. Your network becomes palpable. So if you click on a preference of one of your contacts, you'll see immedialtely who of your other contacts also share this preference. Organization of joint activities is made easy. Click on a company and you'll not only see your contacts belonging to this company, but also a list of your interactions with your contacts belonging to this company. ima-pim gives your network a structure. The same is true for your projects/activities: Click on one of your projects and ima-pim presents a list with the people involved in this project as well as a list of your interactions with these people. ima-pim assists in your project networking. You are able to define your own relationship types. As an example, you may define a relationship 'Introduce these two people'. Drag this relation between two of your contatcs. Whenever you now look at one of these contacts, ima-pim will show you that you had the idea of introducing this contact to the other contact of yours. ima-pim not only stores information about people and objects, but also information about the relations between them. Storing relations is also helpful for objects: For example, link files and appointments to a task. 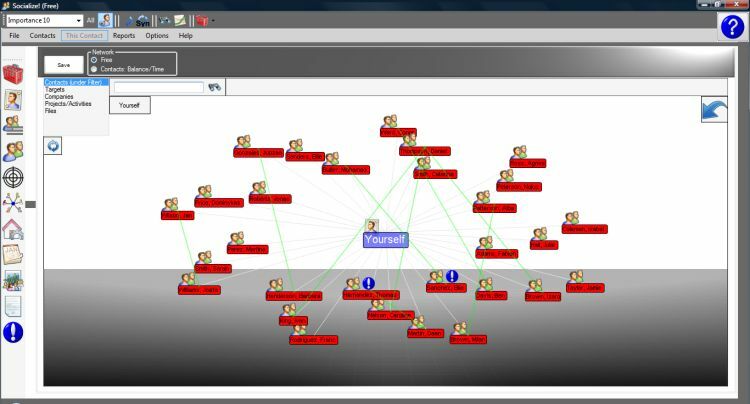 Next time you look at the task, ima-pim presents an interactive network with the files and appointments linked with this task. Anything can be linked. For each contact you have a canvas for virtual sticky notes. ima-pim is a mnemmonic. In ima-pim, tasks are usually added directly under a contact. ima-pim is people oriented. In the tab view of a contact, you'll also see the history of your interactions with that contact. You may notice for some of your contacts that it's always your contact who initiates these interactions while you alway play the passive role - or vice versa. Using ima-pim you'll have some surprising findings about your network. ima-pim also assists in self management and Work-Life-Balance. Be good to yourself, too. ima-pim syncs with Outlook (TM). You may install ima-pim on a USB flash drive. Carry ima-pim and all data with you.